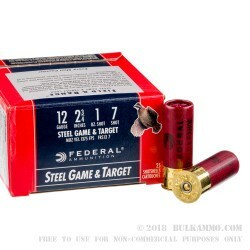 In areas that restrict the use of lead projectiles, these 12ga shotshells by Federal will provide the performance required to take down those flying trophies. 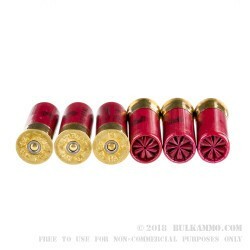 The 2-3/4" polymer shells are filled with 1oz. of #7 steel shot, referred to by many as dove shot. 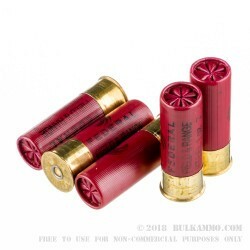 These high-velocity rounds are great for grounding medium-size birds, shooting clay pigeons, and target practice. Federal loads this ammo in-house in their Anoka, MN factory and offer superior performance to other American-made shotshells. The steel shot is non-corrosive, and the polymer shells are reloadable. Federal Premium came into existence in 1922, and their commitment to excellence has made them a favorite among sportsman, competitors, and casual shooters alike. 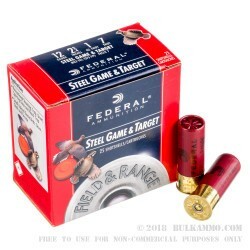 Order your 250-round bulk case of this 12ga ammo and experience high-quality Federal shotshells for yourself!